I previously reviewed the first audiobook in this series, Matched. So, the reason I used the publisher’s description here is that nothing much really happens during Crossed. Yes, Cassia searches out Ky in the border provinces, but even as they are both living much more difficult lives than they ever did in the heart of the Society, and yet it seems that nothing occurs. Basically the entire thing is a set up for the third book in the trilogy. What Crossed does have going for it, though, is that we learn a great deal about Ky’s history, and about just how deep the uprising against the Society really goes. This set up is promising for Condie’s next book, however. Kate Simses is still a great casting call for Cassia. She is young-sounding enough to be convincing as a teenager, and conveys the teenage drama well without making it overly angsty. I was somewhat less impressed by Jack Riccobono. He is ever so slightly old-sounding for Ky and is a bit ridiculous when trying to give voice to Cassia during Ky’s sections. Simses does a much better job doing voices for the boys surrounding Cassia. 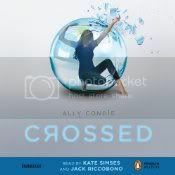 The sound effects in Crossed are not used as judiciously as they are in Matched. They are nearly absent in Crossed until a point near the end where music is used for no apparent reason. It is quite odd, really. I have to hope that the last book in this trilogy will be told exclusively from Cassia’s point of view, so that Kate Simses can narrate the entire audiobook. Other than this, Crossed was very much the transitional book for this series and, although it was not nearly as strong as Matched, it is setting up what will hopefully be a very interesting conclusion. If you liked Matched, you probably need to read this before the third book is released. I really do wish more had happened in this book. The second half is better, but I was fairly bored throughout, and I’m afraid I won’t remember the rest when I go to read the third book. Yeah, if I’ve realized just how much I didn’t need too rush to read this I’d have waited until just before the third book. I felt the same way about the first one – good initial setup then HOURS and HOURS of nothing happening (though I listened to it while commuting with my son & niece when they worked with me this summer, so we have a ton of in-jokes now about that time at the swimming pool and the rock from my grandfather and such). Then at the end, a quick rush of action and promise and a dynamic plot that made me look forward to the next one. So all in all, I’m discouraged to hear that Crossed left you feeling the same way. As much as I loved Matched, Crossed didn’t knock my socks off either. I think you hit the nail on the head, though, as it’s a “bridge” book between Matched and the next book – lots of information, without much forward momentum. Great review – I haven’t listened to the audio (Cassia and Ky already have voices in my head, it would only confuse me at this point!). I liked Matched pretty well, but was disappointed with the Crossed audio too. It was just too slow. You make a good point that it would be best to have Cassia be the only narrator for the final book. That’s interesting that there were sound effects used in Matched- and I don’t even remember the music in Crossed. Too funny. I read this one in book form, so I don’t have an opinion about the audio, but I enjoyed the story and the pacing seemed fine to me. I think part of that may have been that I went into it with a “transitional book” mentality. The best part was learning more about the characters. I would expect more action from the third book, and if there isn’t, then I would be disappointed.